This recital features concert favorites performed by the Transcontinental Piano Duo of Elaine Greenfield and Janice Meyer Thompson. 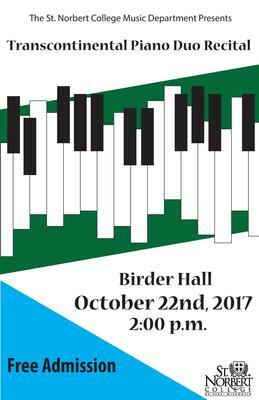 This recital was performed at Dudley Birder Hall. St. Norbert College Music Department, "Transcontinental Piano Duo" (2017). Music Performances. 34.